Novelis global automotive Vice President Pierre Labat predicted that growing Asian demand and mixed-material vehicles would more than double its aluminum sales, Reuters reported Thursday. “Typically what we see is an increase of aluminum percentage of the (automotive) body, which is why we’re projecting to grow from 1.5 million tonnes of aluminum demand this year to 3.5 million tonnes a year in 2025,” Labat told Reuters. If you’re planning on being in the collision repair industry seven years from now — or even during the 2018-25 interval posting such aluminum growth, this matters to you. Aluminum can require dedicated tools and equipment to prevent galvanic corrosion. It also can demand additional precision from shops, such as compensating for the incredibly quick rate of oxidation after the substrate is brought to a bare metal state. Labat told Reuters that Asian nations would grow from a mere 10 percent of the global demand for aluminum to nearly a third of it by 2025. The U.S. doesn’t seem as hot for electric vehicles as China — perhaps making aluminum weight savings to grow battery range and offset battery mass less of a factor. However, American demand could grow. Tesla Model 3s are selling extremely well, electrical infrastructure besides Tesla’s own network is slated to boom, and Audi has predicted that electric cars will be the second of what are considered the four key automotive megatrends (connected, electric, shared, autonomous, in that order) to have an impact. If OEMs opt for global vehicle architecture platforms to reap gains like economies of scale and manufacturing efficiencies, the same vehicles being bought in China could be to a large degree similar to ones sold in the U.S. Which means both Chinese and American repairers would need to be able to properly handle the aluminum on the same vehicle. 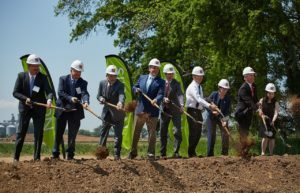 Novelis also demonstrated American demand for automotive aluminum in May, when it announced it had broken ground on a $300 million automotive sheet aluminum facility in Kentucky capable of putting out 200,000 metric tons of the metal. Learn more about OEM structural architecture Nov. 1 during the SEMA show in Las Vegas at “The Rules – and Challenges – of Structural Repair on Modern Architecture” with Dan Black of FCA, Robert Hiser of the Auto/Steel Partnership, Shawn Hart of Audi and Mike Kukavica of Porsche. The OEM Collision Repair Technology Summit course is part of the Society of Collision Repair Specialists’ Repairer Driven Education Series Oct. 29-Nov. 2. Register here for individual RDE classes or the series pass package deal. Labat also predicted to Reuters that the next 10 years would see vehicle designs incorporating both steel and aluminum. Labat said aluminum was increasingly used in automotive bodies such as doors, but would not replace steel completely. “I think we are convinced that the world at least in the next 10 years will be multi-material architecture with aluminum tripling its size,” he said. Novelis’ Guthrie, Ky., plant plays into such a prediction. According to Novelis, the factory “will include heat treatment and pre-treatment lines, which prepare aluminum for use in vehicle parts such as body-in-white, hoods, doors, lift gates and fenders” — the kinds of parts that are a body shop’s bread and butter.